Hollywood Meets Bollywood: Finally, a Love Story? The new year got off to a good start for Hollywood in Bollywoodland. As expected, the global success of James Cameron's Avatar is also playing out in India: it's slated to become the biggest Hollywood grosser of all time in the country. The 3-D extravaganza, also released in 2-D and dubbed in three local languages, has already grossed $15 million across the country, and is expected to edge out Columbia Pictures' doomsday epic 2012, which has made $20 million since its opening on Dec. 18. What's more, in a rare show of heft, the film continues to draw crowds despite the release of Bollywood's 3 Idiots two weeks later. It grossed $60 million to surpass the all-time record for an Indian film in the domestic and international market. Last year was Hollywood's best performance in India to date. The success of the U.S. exports in the world's most prolific movie market  India makes over 1,000 films every year  began a year ago, as Indian audiences from Punjab to Chennai lapped up all genres of films, from Sony's Terminator Salvation to Warner's Harry Potter and the Half-Blood Prince to the Fox Star Studio-distributed Ice Age: Dawn of the Dinosaurs. Even Baz Luhrmann's romantic epic Australia, which tanked pretty much everywhere else in the world, made $2 million on the subcontinent  enough to qualify as a decent run. The Indian box-office numbers are not impressive by U.S. standards, as tickets rates in India are a mere $1.8 compared to $8 in the U.S.; to gross $20 million, a film has to sell 12 million tickets in India, compared to 2.5 million tickets in the U.S. "Our success was a combination of great content across genres, depth of distribution and aggressive marketing," says Vijay Singh, chief executive officer of Fox Star. For Fox and others, India's movie-mad audiences are a vital growth market. Domestic box-office revenues are expected to grow from their $2.5 billion today to over $4 billion in 2012, according to a 2009 entertainment-industry report by the Federation of Indian Chambers of Commerce and Industry and the accounting and consulting firm KPMG. 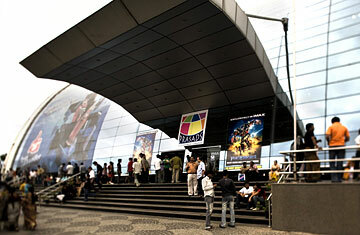 In the past, American studios operating from the Bollywood capital of Mumbai were limited by relatively few outlets; in 2005, there were only 13,000 single-screen cinemas in a country with 1.2 billion people. But India's real estate boom and 9% economic growth rate (it has now backed down to 7%) helped usher in a herd of multiplexes  and new profits for U.S. players. American studios now estimate that 65% of their earnings come from screenings at multiplexes. Hollywood films, which only cashed in on 1% of the total Indian market 10 years ago, now skim 7% of that growing market. The multiscreen outlets have motivated big studios like Fox and Columbia to transplant their U.S. strategy of carpet bombing with prints and an ad blitzkrieg for new releases. Fox, say experts, released 700 film-reel prints to cinemas for exhibition of Avatar with a marketing and distribution budget of $1 million; 2012 was backed by 715 prints and an ad outlay of around $500,000. Three years ago, a big release meant releasing somewhere between 100 to 200 prints at a fraction of the cost. With films having smaller shelf lives now, companies are trying to capture cash flows in the first few days after their release, says KPMG's entertainment-practice head Rajesh Jain. Nevertheless, Western studios' ongoing efforts to make successful Indian films in Bollywood have yet to bear fruit. Sony's $9 million love story Saawariya fell off the radar after a short run in late 2007. Last January, analysts dismissed Warner's $9 million kung-fu comedy Chandni Chowk to China as Bollywood's most expensive flop ever, and the 2008 Disney animation flick Roadside Romeo, co-produced with a major Indian studio, only mustered a three-week run. Despite their high production values, all three films were short on content, say analysts. Still, buoyed by their increasing revenues, studios have not given up. Disney, which has a stake in Mumbai-based film and television producer UTV, is right now making two live-action films. Fox Star CEO Singh says he hopes to start making up to five Indian films a year. He is betting on the studio's first Indian co-production My Name Is Khan, to be released globally next month. It has all the right ingredients: Bollywood screen royalty, a hit director and the requisite hype. And if it clicks, it could be the script for the ultimate Hollywood-Bollywood love story.